Today’s a big day here on Shugary Sweets! This little piece of the internet turns 5 this week!! 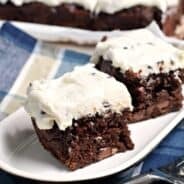 For five years I’ve been coming here to share recipes. And while I won’t scare you with photos from the early days, I will say I think I’ve come a long way. And it’s because of readers (LIKE YOU!). I wouldn’t be here if there was nobody reading and visiting me. So THANK YOU. However, I thought it would be fun to give a little whimsy to today’s post and let you know what my “real life” is like. I’m often asked “what is food blogging? ?” Do I own a bakery? Do I do catering? How do I make money? And if you’ve had any of those same questions, don’t worry. Some of my close family and friends don’t really understand what I do, so you’re not alone. Basically, I create recipes, photograph them myself and share them here on my blog. I then use social media (FOLLOW ME!! Pinterest | Instagram | Twitter | Facebook) to promote those recipes to get traffic (that’s you!) back here on my website. WHY? Because the more people who visit my website, the more money I can earn (through advertising…sorry about those annoying ads, but they help pay the costs of running a website). I also work directly with brands (DOVE Chocolate, Fisher Nuts, Crunch Pak Apples, etc) to create recipes and share their products with you. No, I don’t cater or own a bakery. But if you’re my friend and you live near me, you’ll be blessed with some goodies dropped off at your doorstep from time to time. So now, the fun part. I asked a bunch of my food blogging friends to answer a simple question for me (yes, I have more online friends than real life friends, we’re like a big dysfunctional family, us food bloggers!). I can relate to nearly every one of those mentioned above. Delivering cakes with slices missing? TOTALLY. More photos of food than family? Sadly, yes. Messy house? No dinner? Mismatched dishes? Yes. Yes. Yes. But, let’s talk about today’s celebratory recipe! I took my favorite, easy, one bowl blondie recipe and added in some swirls of Nutella. Because, duh, I love Nutella, and it adds the perfect nutty, sweetness to this recipe. 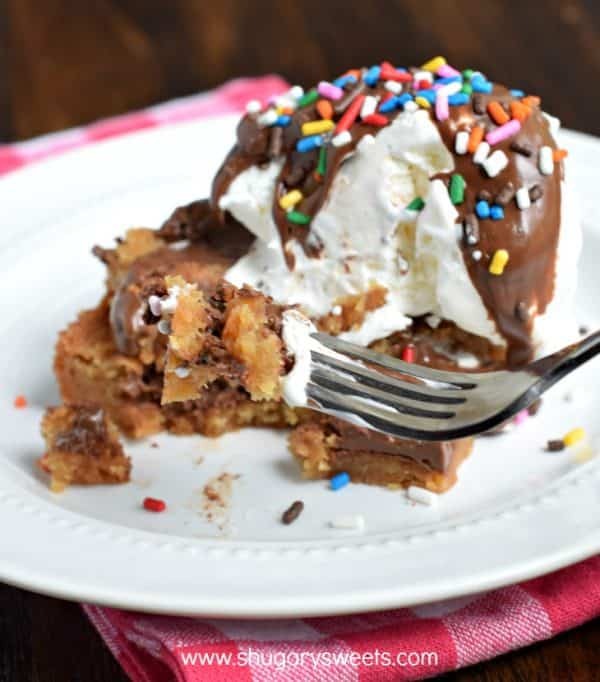 And, it’s not a party until it’s topped with ice cream, melted Nutella, and sprinkles! Am I right? 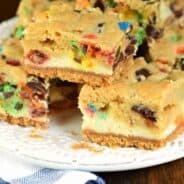 I find these blondies taste best the second day. Warm it up in the microwave for a couple seconds before adding your ice cream. Oh wait. Confession. You might be a food blogger if…..you find out you have no ice cream in the freezer so you take a scoop of frozen Cool Whip for the photo shoot, nobody can tell the difference! Preheat oven to 350°F. Line an 8-inch baking dish with parchment paper. Set aside. In a mixing bowl, combine melted butter with brown sugar. Add in egg, vanilla and salt. Add flour and mix just until combined. Press batter into bottom of prepared baking dish. Spread Nutella on top of batter, in about 4 lines, using a knife to make swirls. Bake for about 22 minutes, remove from oven and cool. 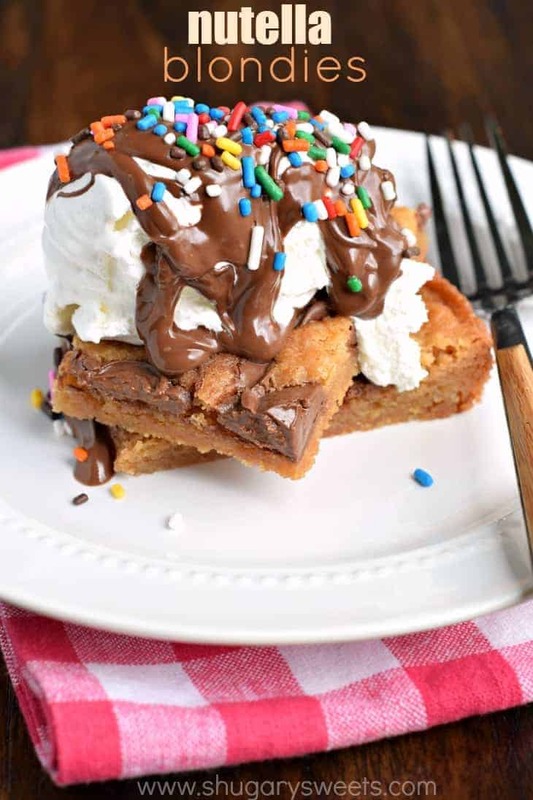 To serve, enjoy as a bar, or make a decadent treat by warming it up and topping it with ice cream, melted Nutella and sprinkles! *Store in airtight container. I prefer these the second day, I think the flavor is more intense and the blondie is chewier! Love the contributions from friends, Aimee! All so true, especially Lisa’s. I have so many more pics of food than my family. But that’s reality. Oh, and how about feeling really self-conscious at the checkout line because your basket is full of candy and chocolate while other people are buying, like, real food? 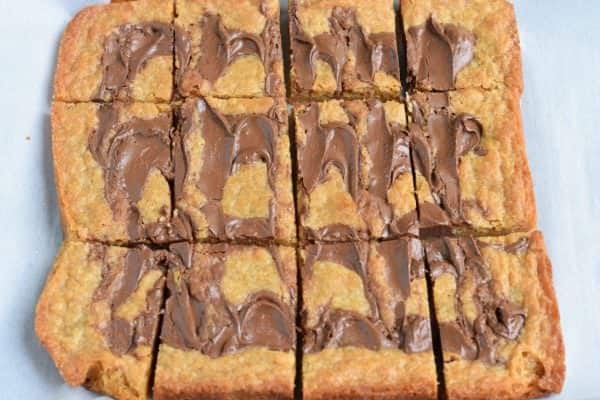 And love these Nutella blondies. The ice cream on top is a perfect touch! Ahhh, the life of a food blogger 🙂 AND YES, totally have looked at the contents of my basket and have even tossed in some salad mix because I feel guilty for the junk food, haha! Yep, yep, yep…I can relate to ALL OF THE ABOVE. These look SO good. Love that gorgeous swirl!! Congratulations on five years of blogging, Aimee! That is so wonderful and exciting! And I whole-heartedly agree with EVERY SINGLE ONE of those blogger statements. I have so many food props, no matching sets, I get mad at my husband if he eats my work, the list goes on! And what a great way to celebrate with these blondies! Yum! 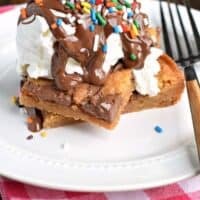 Wow these look so good, I love anything with Nutella in it!! YAY for five years! These look like the perfect treat to celebrate with. Loved your “You might be a food blogger if…”! I loved reading each and every one of those because they are SO true! Happy 5 years to you! Congrats on 5 delicious years, Aimee! You were one of the very first bloggers to comment on my site and I will never forget it. ???? 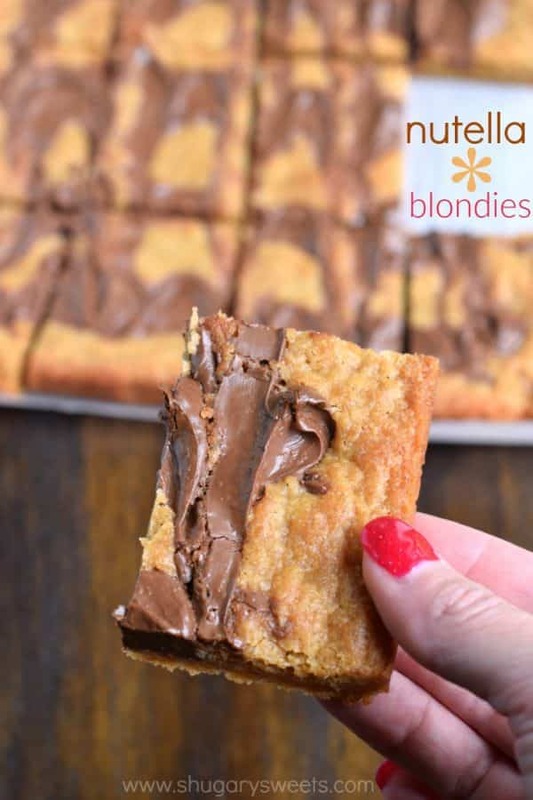 These blondies look like an amazing way to celebrate with those gorgeous Nutella swirls — I need about a dozen please! Happy Blogiversary! 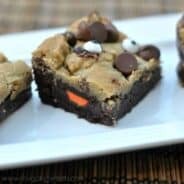 And can I faceplant in those blondies?! Bahaha!! 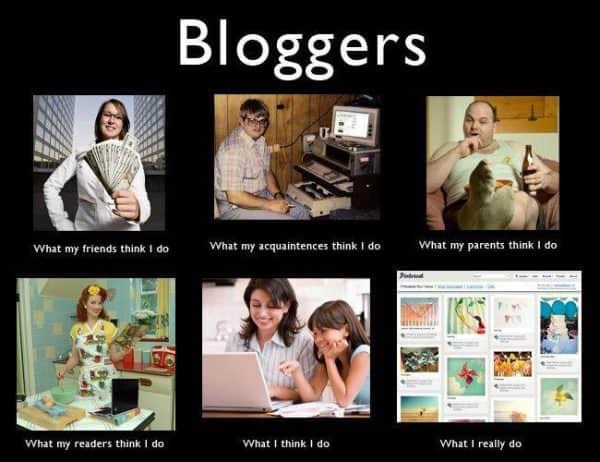 Loved the you might be a food blogger if… so totally true!! 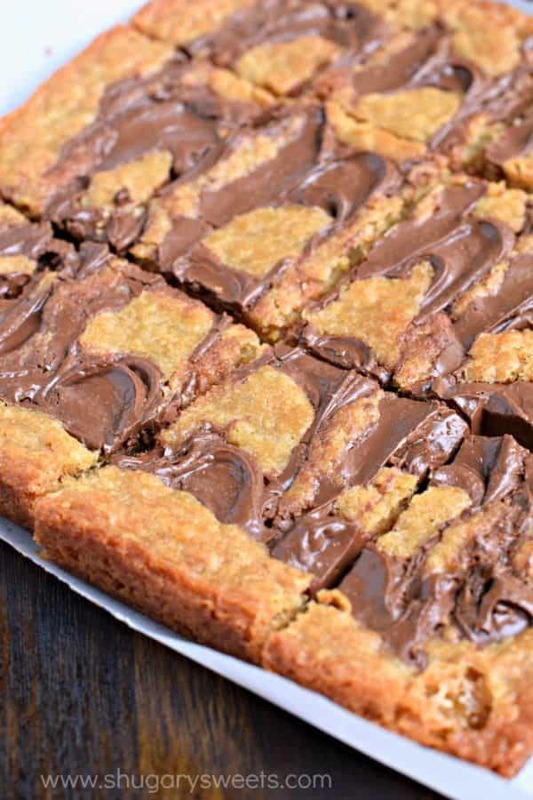 These blondies look so good and love the nutella swirl! suuuch a GORGEOUSly thick swirl of nutella!!! Hahaha “real life” according to food bloggers! These made me giggle…mostly because every single one applied to me too. Happy Blog Birthday! It’s been so much fun getting to know you over the years, and I puffy heart love that our love of baking and blogging brought us a special friendship! Just be glad I’m not there right now to squeeze your guts out! XOXO!!! Miss you girl 🙂 You’re one of the best things that has come into my life because of blogging! Happy 5th Blog Birthday friend. Cheers to many more. Scheduled to share on FB because everyone needs these. Yummed & pinned. HI! I didn’t have any light brown sugar so I used dark brown. My dough came out runny, and not like the consistency in your video. Would the dark brown made it like that? Will try again when I have a light brown sugar.